Shaped like a small surfboard, the Morty Coffee Table by Eurostyle is sure to make waves in your modern home. The classic walnut finished base has a unique triangular leg design that proves to be sturdy and asymmetrically alluring. 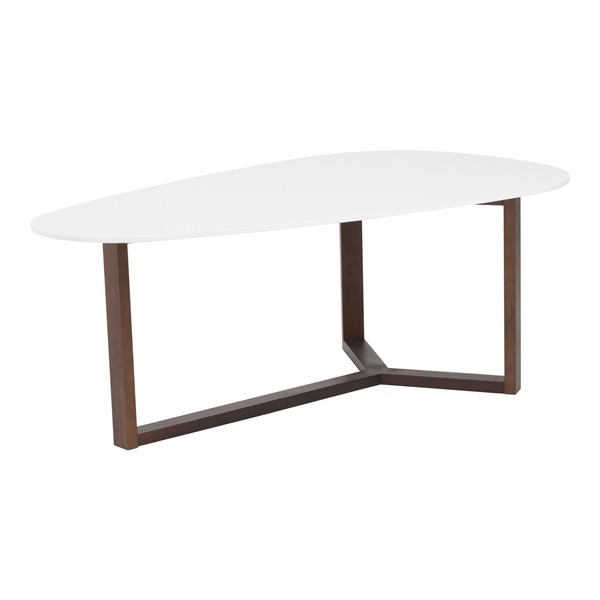 The white matte top is a bold modern contrast to the base, giving the whole table a design confidence that defies normal coffee table conventions. Whether this piece will be the centerpiece in your room scheme or an accent to another main feature, the Morty is sure to impress either way. The top of the Morty Coffee Table by Eurostyle is made from a sturdy & durable MDF (medium-density-fiberboard) and coated in a stain-resistant matte lacquer finish.